Mango Mania = Sailfish, grouper and more !!! Home | Browse | United States | Florida | Fort Pierce | Mango Mania = Sailfish, grouper and more !!! California boys, Patric & Matt Evans, with buddies Bing, Curtis, Matt & 'Jake the Bear Hunter', came to town for their bi-annual fishing fix on the Mango yesterday June 18th. With live bait difficult to catch, we muddled our way through the day and ended up having another fun-filled trip offshore of Florida's Treasure Coast! Sailfish, grouper, kings and amberjacks kept the action happening.....take a look at these great photos of our day! 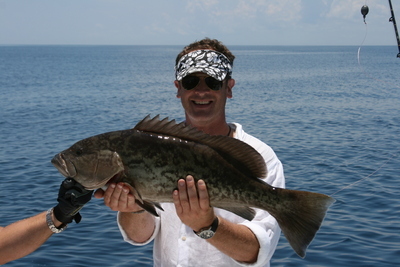 Fish Species: Sailfish, grouper, kings & amberjack !!! 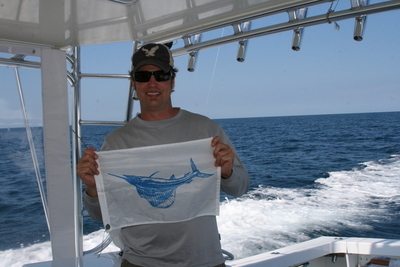 Proud of his sailfish, Bing prepares to hoist a release flag!